You may not think of Nigeria as a wealthy country. It is – sort of. Nigeria has the second-largest economy in Africa. Lagos is a big, vibrant port city with a population of 21 million people. The economy of Lagos alone is bigger than many African countries. In many ways, Nigeria is a wealthy country. However, nearly 100 million Nigerians live on less than $1 per day, which makes extreme poverty a big problem in the country. That said, the following four billionaires are the richest people in Nigeria. They have made their fortunes in oil, telecommunications, and sugar refining. Their collective net worth of $24.65 billion is pretty much what it would take to pull every Nigerian out of extreme poverty. Femi Otedola made his fortune through his company Forte Oil, which runs more than 500 gas stations across Nigeria. He also has interests in finance and power generation. Folorunsho Alakija is Nigeria's first female billionaire. She began her professional career as an Executive Secretary in Lagos, Nigeria, while simultaneously launching her own tailoring business. Her company flourished, and she went on to become the National President and a Trustee for the Fashion Designers Association of Nigeria. In the early 90s, she applied for a license to begin prospecting for oil. It turns out, the plot of land she was granted was sitting on over one billion barrels of potential oil. She owns 60% of the drilling venture off the coast of Nigeria. After the billion barrels were discovered, the Nigerian government attempted to take the land grant back. A 12-year legal battle ensued that reached all the way to the Supreme Court of Nigeria. Folorunsho was victorious and her patience was rewarded handsomely. As soon as the legal verdict came down, Folorunsho was instantly worth billions of dollars. Mike Adenuga built his enormous fortune in mobile telecommunications and oil production. In 2006, he founded Globacom, the second-largest mobile phone network in Nigeria. With over 24 million customers in Nigeria, the company also operates in the Republic of Benin, where it recently acquired licenses to start businesses in Ghana and the Ivory Coast. What's more, his Conoil Producing is considered to be one of the largest independent exploration companies in Nigeria, with a production capacity of 100,000 barrels of oil per day. 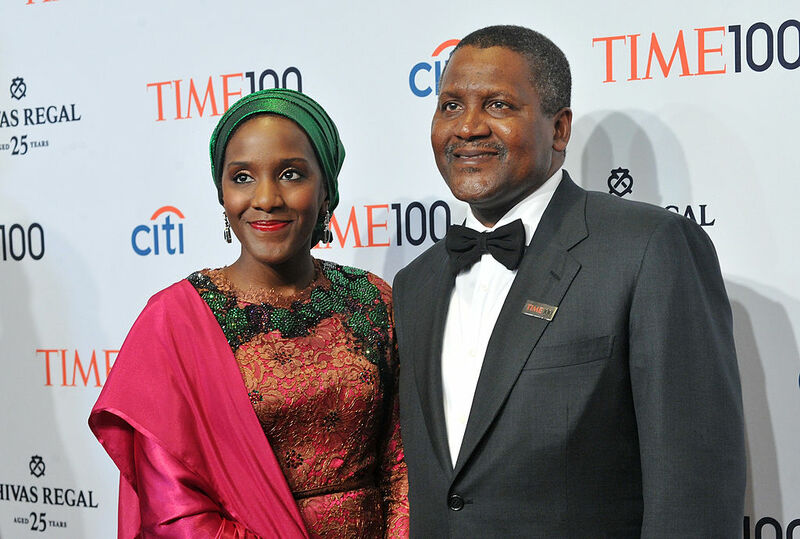 Aliko Dangote owns the eponymous Dangote Group, which operates in the commodities field. Dangote is based in Nigeria and also does business in other African countries, including Benin, Cameroon, Ghana, South Africa, Togo, and Zambia. He is the richest person in Africa. The Dangote Group employs more than 11,000 people in industries such as sugar refining, flourmills, food distribution, and cement. In fact, The Dangote Group's businesses account for one fourth of all businesses on the Nigerian Stock Exchange. Folorunsho Alakija is the richest black woman in the world. She's also a former secretary and fashion designer. How'd she pull this incredible feat off? By fighting her way to the top, tooth and nail. How did Folorunsho Alakija go from secretary, to fashion to designer to a billionaire oil tycoon who has just replaced Oprah Winfrey as the richest black woman? Her story is inspirational and amazing. Of the 2,043 billionaires in the world, less than 1% are black. There are 10 black billionaires in the world today.